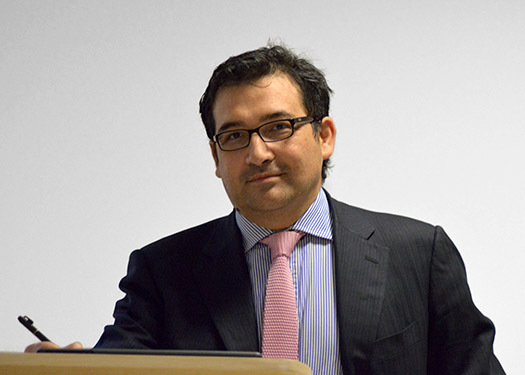 Dr. Alonso Peña is SDA Professor at the SDA Bocconi School of Management in Milan. He has worked as a quantitative analyst in the Structured Products group for Thomson Reuters Risk and for Unicredit Group in London and Milan. He holds a PhD degree from the University of Cambridge on finite element analysis and the CQF from Fitch Learning. He has lectured and supervised graduate and post-graduate students from the universities of Oxford, Cambridge, Bergamo, Pavia, Castellanza and the Politecnico di Milano. His area of expertise is the pricing of financial derivatives, in particular structured products. Alonso has publications in the fields of quantitative finance, applied mathematics, neuroscience and the history of science. Dr. Peña has been awarded the Robert J Melosh Medal: First Prize for the Best Student Paper on Finite Element Analysis, Duke University, USA; and the Rouse Ball Travelling Studentship in Mathematics, Trinity College, Cambridge. He has been to the Santa Fe Institute, USA, studying complex systems in the social sciences. His publications include: "The One Factor Libor Market Model Using Monte Carlo Simulation: An Empirical Investigation", "On the Role of Behavioral Finance in the Pricing of Financial Derivatives: The Case of the S&P 500", "The Perfect Storm: Société Générale and Jérôme Kerviel", "Option Pricing with Radial Basis Functions: A Tutorial", "Application of extrapolation processes to the finite element method, "On the Role of Mathematical Biology in Contemporary Historiography". Alonso is currently a tutor for the CQF and Visiting Faculty at the Indian Institute for Quantitative Finance, Mumbai.